Eggplant and fresh basil pizza - a homemade vegetarian pizza. Eggplant and basil is a simple pizza combination, but, if you're like my friend Jason, it'll soon be your favorite. Jason insists on placing full leaves of basil (fresh from his garden) underneath each slice of eggplant, as well as some snipped pieces on top, too. There's not much to this vegetarian pizza - just pizza dough, pizza sauce, eggplant, fresh basil (it has to be fresh!) and some cheese. I usually like a bit of garlic on my pizza, but in this eggplant and basil recipe, you want to keep things simple so that the focus is on the flavor of the eggplant and fresh basil, and nothing else. Plus, I usually use a pizza sauce that has plenty of garlic already. If you do need to add more to this simple pizza, the only thing I can condone is some thinly sliced tomatoes which will add a lovely fire-roasted flavor. Set oven to broil (about 500 degrees). Slice eggplant into rounds about 1/3-inch thick. Brush with olive oil and grill for a few minutes on a grill pan or on the barbecue for about 2-3 minutes on each side or just until tender. Set aside. If you don't have a grill handy, you could also roast them in the oven for about 10 minutes at 300 degrees on a baking sheet. Spread a layer of pizza sauce on top of the dough. On top of the sauce, arrange the grilled eggplant slices in a single layer and tuck a whole basil leaf under each slice. Depending on the size of your eggplant, you may have some leftover. Dip it in the sauce and eat it as an appetizer while you're waiting for your pizza to cook! Chop 3-4 whole basil leaves coarsely, then sprinkle them on top of the pizza, followed by a layer of grated mozzarella cheese. 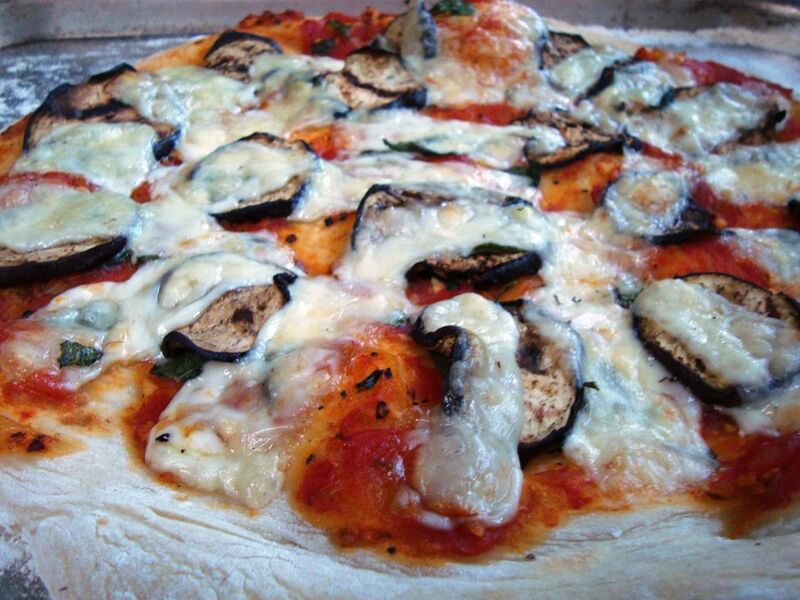 Bake your vegetarian eggplant pizza in the oven for 10-15 minutes, or until cheese is just bubbly and crust is lightly golden brown. Note that as with most pizza recipes, the amount needed is really an approximation, so feel free to adjust and add more or less as you like.